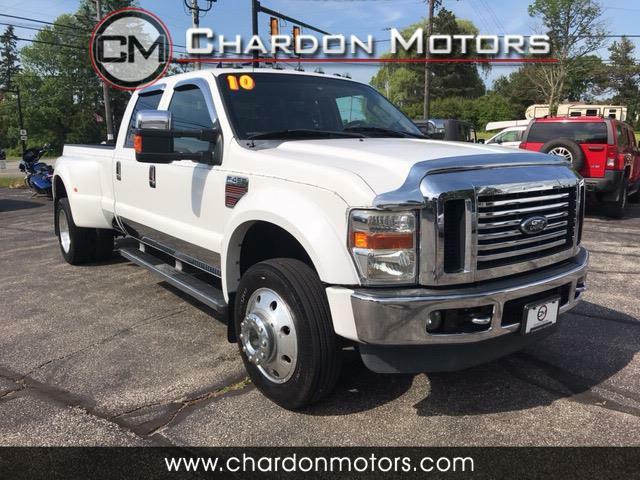 2010 Ford F-450 Crew Cab Lariat 4x4 DRW Offered by Chardon Motors. This is a CARFAX CERTIFIED vehicle. Completely loaded! 6.4L Diesel! Very clean inside and out! Black leather interior (looks and feels like-new), heated front seats, navigation, dual auto climate, drivers memory seat, power passenger seat, factory power moonroof, bluetooth, tow package, fifth wheel setup, TEN lug wheels, factory side steps, auto dimming rearview mirror, sliding power rear window, steering wheel controls, power adjustable pedals, built in trailer brake, and much more. DPF and EGR deleted with H&S Performance Mini Max Performance unit too! Drives perfect. Message: Thought you might be interested in this 2010 Ford F-450 SD.